One hundred years ago, in March 1909, Shackleton’s Nimrod Expedition came home safely. When Scott heard the news, he immediately contacted Tom Crean with the intention of planning his own adventure. And thus the Terra Nova Expedition was born. The remarkable Tom Crean ran away to sea aged fifteen and spent more time in the unexplored Antarctic than Scott or Shackleton, and was one of the few to serve and outlive both. Michael Smith’s original biography of this enigmatic figure spawned a Guinness ad, a one-man play that is still touring today and a children’s version of the Ice Man which has been chosen as the ‘One Book’ for literacy groups in Cork and Limerick. Tom’s story continues to fascinate people because of his extraordinary feats of survival, his bravery and his dedication to his comrades. At the end of his expedition days, Tom came home to Ireland, married and built a pub, the South Pole Inn, in Annascaul, County Kerry. He was an ordinary man who did incredible things, a modest man who became a hero. 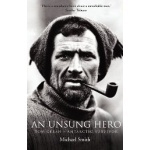 An unforgettable story of triumph over unparalleled hardship and deprivation.